Grass! And not the sort Clinton smoked but allegedly never inhaled. No, this is the stuff that’s now waist high and which grows every time our backs are turned: constructing chicken houses, working in the vegetable garden and writing this blog, every time we look at it, it seems to have precociously added another few centimetres, covering a large part of our land. In The No Work Garden, Bob Flowerdew says, “In gardening one of the biggest makers of work and wasters of time is the grass which I reckon needs cutting about thirty times a year” and, in Introduction to Permaculture, Bill Mollison and Reny Mia Slay claim “The American lawn uses more resources than any other agricultural industry in the world. It uses more phosphates than India, and puts on more poisons than any other form of agriculture” … and we’ve got nearly two acres of the stuff. 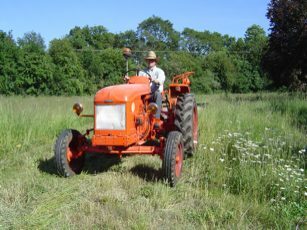 I finally managed to sharpen and re-attach the blades to our “topper” (basically a huge Flymo) and attach that to our tractor, (a 1963 vintage Renault) both of which came with the property. Not being familiar with agricultural machinery, nor having a helpful manual, it took me ages to work out how to connect the topper to the tractor. There is a deafening hole in the exhaust manifold and it’s not particularly fast so, whilst our first drive round on the tractor was a fun and novel experience, sitting on some sort of very noisy, fossil-fuel dependant grass cutting device for several hours every week neither fills us with anticipation nor is very “permacultural”. Permaculture design includes the idea of linking outputs and inputs. So where long grass is an undesirable “output” of our fields (as long as it needs cutting regularly) if we can link it into the input of another part of the overall system, we can reduce the undesirable input of time and fuel and actually make it productive. Which is how we came to order the ten geese I mentioned on the last post! Once installed, they’ll turn this “problem” into happy geese and, ultimately, meat for the table. I suggest you get a goat or two, to take care of that grass issue. Not only are goats great at keeping grass short, they produce tasty milk and cheese, and goat curry is especially good eating! I inherited goats when I moved house, not knowing too much about them I bought The New Goat Handbook. 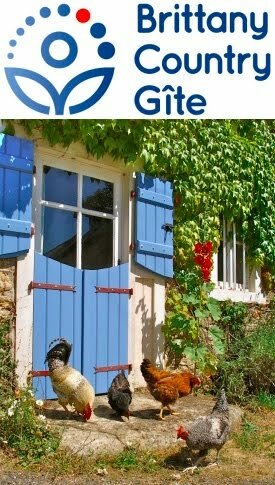 The book starts by saying "If you are looking for animals to keep your lawn trimmed, you won't be happy with goats because of the way they graze. In this case, sheep are much better "lawn mowers"." It's not true that goats eat everything, more so that they eat everything that you dont want them too - flowers, trees, etc.